Dale White Jr., DC, FICC, is a Chiropractor who specializes in nonsurgical care for spine, disc, and musculoskeletal conditions. He brings over 39 years of experience to his patients at River Oaks Chiropractic Clinic in Fort Worth, Texas. Dr. White is committed to providing safe, natural Chiropractic care and an exceptional patient experience at every visit. Through conservative treatment strategies that focus on rehabilitation and lifestyle enhancements, Dr. White addresses injuries, alleviates acute and chronic pain, and enhances overall health and wellness. Before he became a Chiropractor, Dr. White was a patient. Troubled by low back pain caused by an excruciating low back disc problem, he found relief from a Chiropractor after conventional treatments failed. Thanks to the Chiropractic treatments that fixed the cause of his pain, his back pain disappeared, he was able to avoid the surgery that had been recommended to him, and the medications that were masking the pain. The transformation Dr. White experienced was life-changing and inspired him to become a Chiropractor himself. 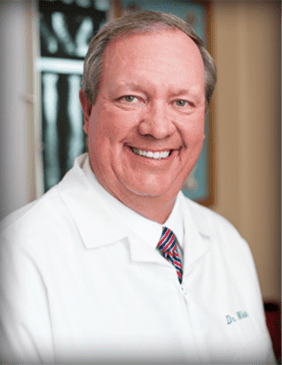 Dr. White attended North Texas State University in Denton where he played on the golf team, and earned his Chiropractic degree from the Texas Chiropractic College in Pasadena, Texas. He is a fellow of the International College of Chiropractors, and is licensed as a Doctor of Chiropractic in both Texas and Oklahoma. Dr. White is married with six children. He is proud to have his second-oldest son, Don White, DC, and his daughter-in-law, Valerie Fletcher, DC practicing Chiropractic alongside him at River Oaks Chiropractic Clinic, thus continuing the family legacy of providing outstanding Chiropractic care to the Fort Worth community.